In the configuration, just type in the skill ID's that should be draw skills. Note that they must be magic unit skill types. Command Setup - directly designate the draw skill as a command. Command Setup must be placed above this script for the add-on to be applied. This is nice. Do you plan on doing a Junction system with the Magic Units as well? 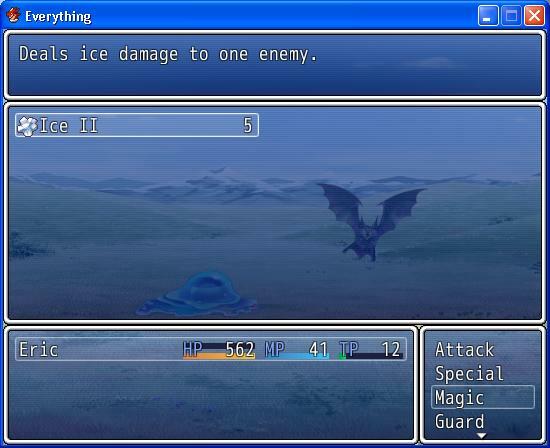 The Junction system, from Final Fantasy VIII, allows the player to junction (attach) magic to parameter slots such as ATK, SPI, Mag-ATK, etc. altering the value of the parameter based on the affinity level of the magic to that parameter. Nice sir, I was going to ask about having an attack with a weapon Draw...but custom attacks can handle that. I am impressed and I am pretty sure I will use this. Many thanks for the awesome scripts. I got this error when I tried to draw magic from an enemy. Also, I was wondering, is there ways of drawing things other than the magic from enemies? 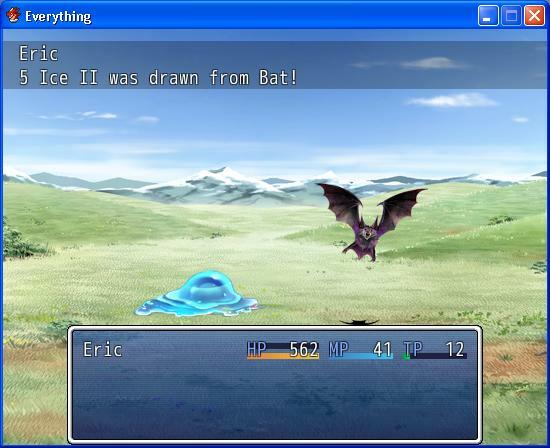 Or is that all you can do, because in FFVIII you could also draw summons, "Guardian Forces", from enemies as well. 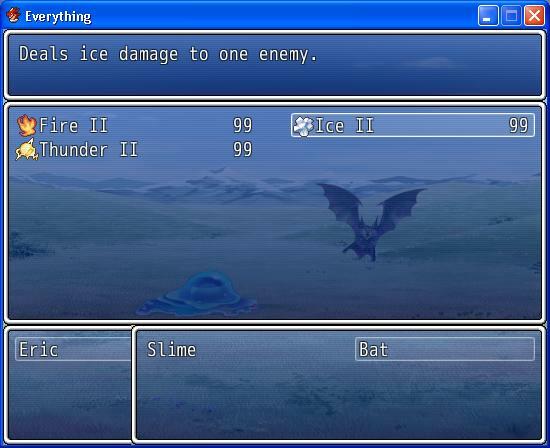 could an option of stocking and casting like in ff8 be added? Describe how you've setup the project and how you drew the magic. Basically, when you choose which magic you want to draw, that ID is stored with your action, which should be set when you choose a skill with draw effect. Did you use some sort of force action? That might get around it and you end up with no draw_id set. Of course, it may just be case of poor design, but I couldn't think of where else to store the magic that you want to draw. Unfortunately the current design only really allows you to draw skills. Which means you can always assign a skill to be one of the summons, and when one of your actors "has" that "summon", you would remove that skill and add the summon to your party, which could be an actor. I'd have to bypass the default skill-use checks, which might get ugly. I've set it up so that draw is a command skill, using your other script. I've added the draw ability to the main character. Not really sure where I went wrong, I'm sure you'll spot it though. lol actually I'm not sure where the issue is coming from, since it looks like an issue with the Action itself. script 'window_skilllist' line 81: nomethoderror occurred. 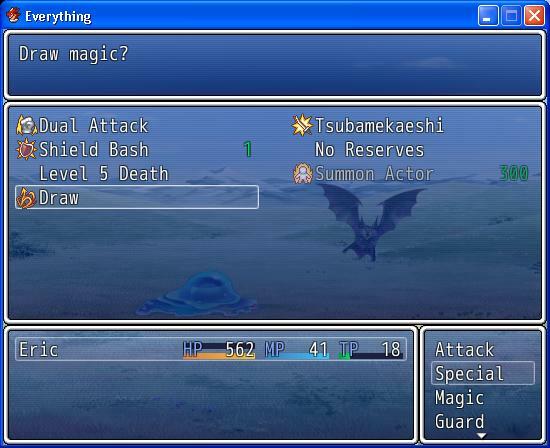 then the actor uses draw but does not receive any magic units any help? I can get a draw point to work, but I can't seem to draw anything from enemies. The right event is a draw point, the top and left events are battles with monsters who should be able to have skill 4 "magic" drawn from them. When I use draw on the monsters a blank menu shows up. I would to say that I figured out the problem I was having. Beginner's mistake: I gave the actor the skill type but not the actual skill.